Jewelle Sturm died from an accidental drug overdose on April 30, 2010 in Los Angeles, CA. Ms. Sturm was three weeks away from her 29th birthday. She was an original writer in the classic oral tradition of spontaneous prose and poetry. She was a natural healer and showed great compassion for those who also suffered from mental and emotional disorders. It is in her honor that this Free Referral Service was born. We recommend men and women to professional and effective rehabilitation programs. This service is made possible by contributions from the annual Experience, Strength, and Hope Award Charity Event. 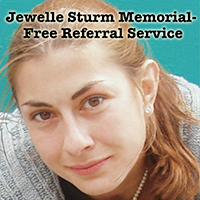 The Jewelle Sturm – Free Referral Service provides access to professional and effective rehabilitation programs for men and women so that other families may be spared the sadness of a lifetime. For more information, please call 818-762-0461.